C-FROD at Montréal - CYUL, Québec. N9758N when turbine powered, at Ketchikan. N9758N when visiting Nantes, France. N9758N at the Biscarosse seaplane event. • CF- ROD Rodair Inc., Montréal, QC. Delivered 09-Nov-1963. • CF- ROD Gerard Miron and Adrien Miron, St. Augustin, QC. Regd 05-May-1964. • C-FROD. Adrien Miron and the Estate of Gerard Miron, St. Augustin, QC. Regd 29th March 1968. • C-FROD Gilbert Miron, St. Augustin, QC. Regd Nov-1975. • N9758N Temsco Helicopters Inc., Ketchikan, AK. Regd Jan-1987. Canx Oct-1991. • N9758N Taquan Air Service Inc. Regd May 1992. Ceased operations Dec-1999. Power plant. Converted to Vazar turbine by Kenmore Air Harbor at Seattle while with Taquan. • N9758N A.D.M.S.E Inc., (Association Au Dela de Mermoz et St.-Exupery), Wilmington, DE. Regd 10-Mar-2000. Accident: Didier la Forêt - en route Lyon- Bron airfield to Cherbourg. 01-July-2000. Following power failure crash landed in a field. The initial impact caused hydraulic fluid to leak and this caught fire, burning all around the aircraft. All on board safely evacuated the aircraft. 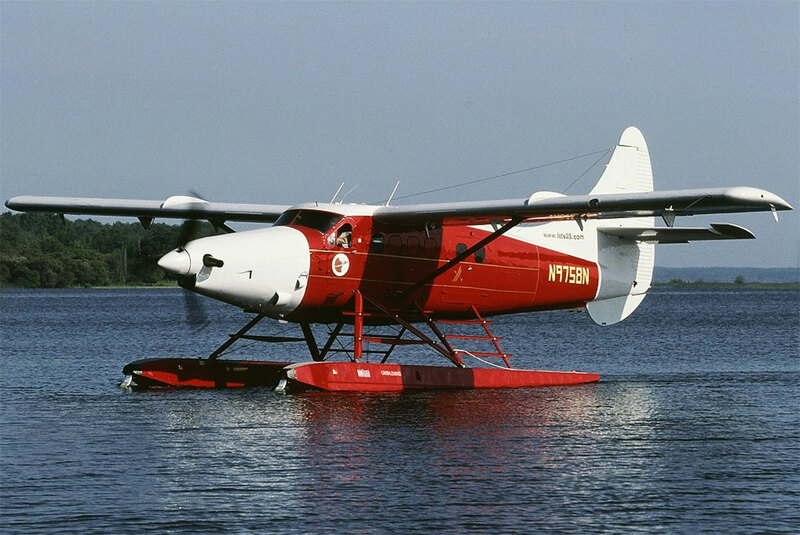 Otter 440 was delivered on 9 November 1963 to Rodair inc of Montreal, registered CF-ROD. This was a company formed by Rodrigue Turcotte with a fleet of fifteen aircraft (including a Turbo Beaver and a Mallard), which were used to ferry rich Canadian and American businessmen to his private club, Rod Fish and Game Club, near Mont Laurier in Québec. However, the Otter was only owned by Rodair over the winter of 1963/ 1964, when the club was closed, before being sold to two very rich Canadians, Gerard Miron and Adrien Miron of St.Augustin, Québec to whom CF-ROD was registered on 5 May 1964. Brothers Gerard and Adrien Miron (Miron et Frères) were a well known family from Montréal who had built up a very successful cement business. They also had extensive interests in racehorses and other business interests. Over the years they operated an eclectic selection of aircraft for their personal and business use – including Beavers, a Mallard, a Lodestar, a PBY and several DC-3s. They had a 700 acre farm at St.Augustin, where the aircraft were based. 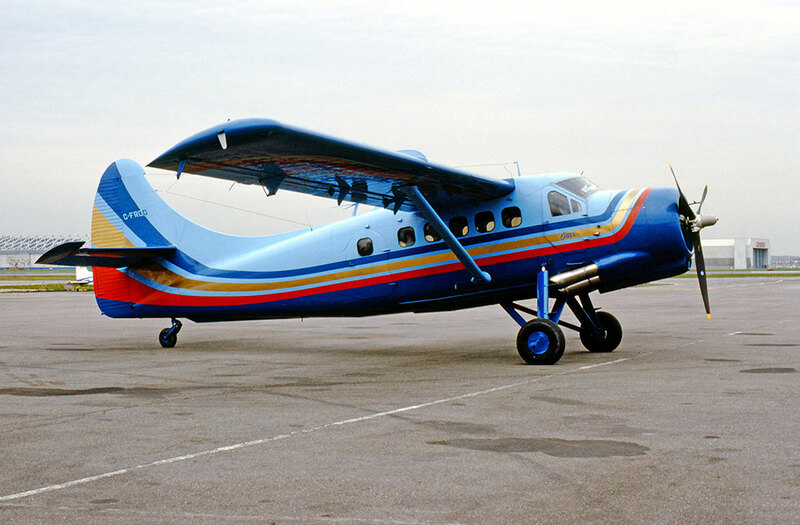 They had previously owned Otter CF-EYY (19) between September 1954 and December 1956. In June 1961 they took delivery of Otter CF-AGM (400) which crashed in September 1963 and to replace it they bought CF-ROD from Rodair. Following the death of Gerard Miron on 29 March 1968 the Otter was re-registered to Adrien Miron and the Estate of Gerard Miron. The Otter was noted at Dorval Airport in March 1971, all white with a red cheatline and red tip of tail, no titles. It continued to fly for the Miron family for many years. When it was noted at Dorval in May 1984, as C-FROD, it had a much more flamboyant colour scheme, varying shades of blue and orange. The registration of Adrien and Estate Gerard Miron was cancelled 12 June 1986 and the Otter registered to Gilbert Miron. This registration was cancelled on 20 January 1987, on which date the aircraft was exported to the United States as N9758N. 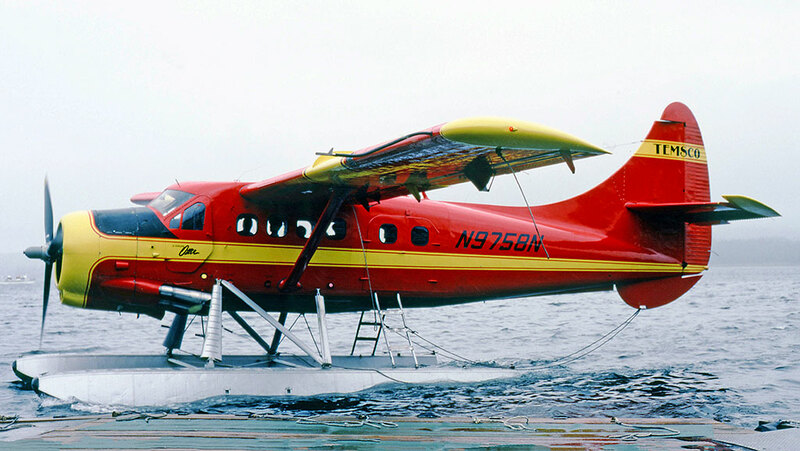 The Otter had been flown, on floats, all the way from Montréal to Ketchikan, Alaska in its Miron colours. It was then flown south to Boeing Field, Seattle , Washington where it was paint stripped and overhauled. It was re-painted red overall with a yellow cheatline and yellow tail band, which contained the ‘Temsco’ title. 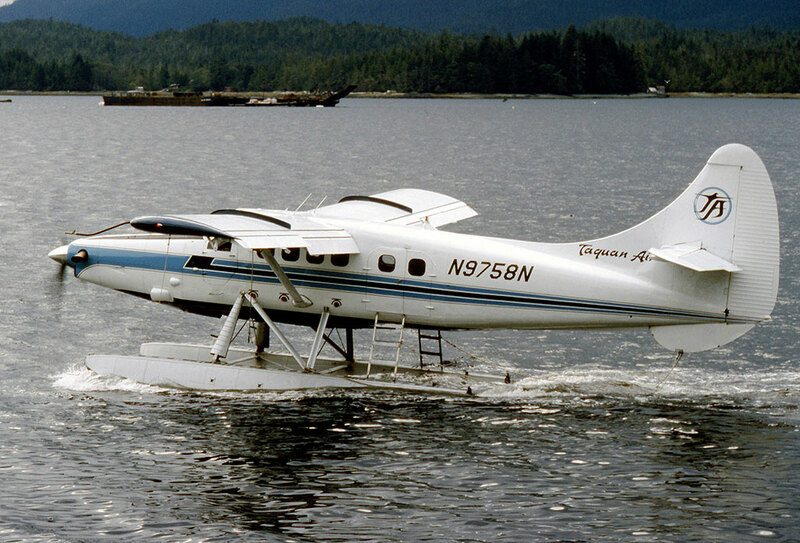 It then returned to Ketchikan registered N9758N to Temsco Airlines and entered service, part of its large Otter fleet. It was to fly for Temsco Airlines for nearly five years. The Otter flew as part of Temsco's large fleet of Otters, on scheduled and charter services out of Ketchikan, until the airline announced abruptly on 28th October 1991 that its final services would take place the following Friday, citing “adverse economic conditions and increased competition”. Its operations were taken over by one of its competitors, Taquan Air Service Inc, to whom N9758N was registered in May 1992, and it went on to fly for Taquan on its services out of Ketchikan for eight years. Taquan arranged for the Otter to be converted to a Vazar turbine, the work being carried out at Seattle by Kenmore Air Harbor. 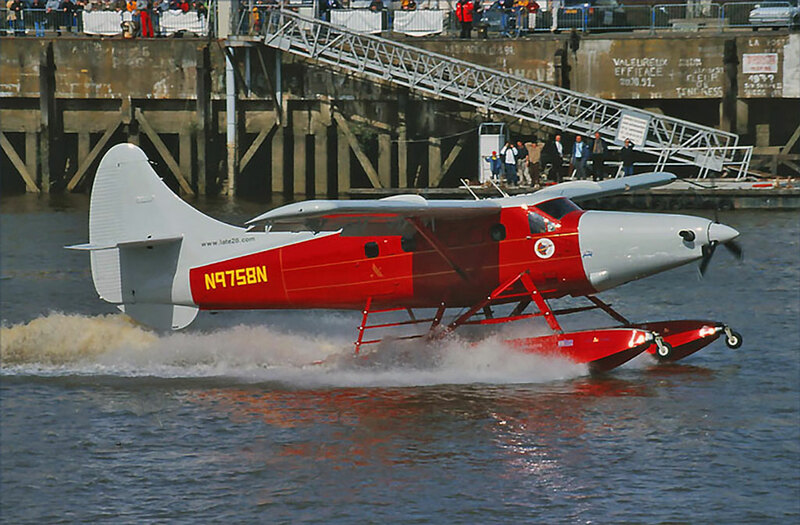 Sadly, Taquan also ceased operations in December 1999 and Otter N9758N was sold. The purchaser of the Otter was a French group, who acquired the aircraft for a special project, to honour the memory of two French aviation pioneers of the 1930s, Jean Mermoz and Antoine de St.- Exupery. The name of the group was the Association Au Dela de Mermoz et St.-Exupery, with offices in Paris. The Otter, which was to remain on the American register as N9758N, was registered on 10th March 2000 to an American company formed for the purpose, A.D.M.S.E Inc., of Wilmington, Delaware which took its name from the initials of the Group. The project was initiated by a French Navy pilot, Captain Regis de Lassus and the pilot of the Otter was a French-Canadian Andre Cantin, who had accumulated 14,000 flying hours over thirty years of floatplane flying. He took delivery of N9758N in Vancouver and flew it first to St.Paul, Minnesota where Wipaire 8000 amphibious floats were fitted, the radios upgraded and it was painted in an unusual red colour scheme, to resemble the Latecoere 28 aircraft flown by Jean Mermoz on airmail flights across the South Atlantic during the 1930s. From St.Paul the Otter then continued to Bangor, Maine where ferry tanks were installed. It then flew to St.Johns, Newfoundland and an eleven hour flight took it to Santa Maria in the Azores. The next day, pilot André Cantin continued on to Porto in Portugal in seven hours and completed the ferry flight the following day in five and a half hours to Toulon in southern France. It was intended that the Otter embark on a world tour, which was to have started on 23rd September 2000 with N9758N taking off from the River Seine in front of the Eiffel Tower. The proposed routing would have taken the Otter via Barcelona-Casablanca-Rio de Janeiro-Buenos Aires-Santiago-Sydney-Hong Kong, through India and Africa to Beirut and then back to Bordeaux, arriving at the end of May 2001. Before this world tour, the Otter undertook a tour of France, starting on 24th March 2000 at St.Raphael on the Mediterranean coast near Nice, also visiting Hyeres, a French Navy base and Nantes on the Atlantic coast during April. On 6th May it arrived in Nice, landing in the Baie des Anges and then entered the City by a taxiway over the sand laid by the Foreign Legion. On 18th May it was at Beauvais and arrived at Versailles on 20th May, landing on the Grand Canal where it remained for a week. It also visited Toussus-le-Noble airfield near Paris for a few days, and on 29 / 30 May was at the 'warbird' meet at La Ferte Alais. At all these stops, it was on view to the public and the project's organisers gave talks on the aircraft and on the history it was promoting. On 2 / 4 June 2000 it was at Biscarosse for a sea-plane fly-in, and undertook a formation flight with a Beaver. It was at Angers on 16th June and Herblay on the 20th and arrived at Lyon on 22nd June, landing on the Rhone. It was taken out of the river by a crane and pushed by a crowd of people to Place Bellecourt, with extensive television coverage. On 1st July 2000 the Otter took off from Lyon- Bron airfield en route to its next destination at Cherbourg, but it had to make a forced landing near Didier la Forêt en route due to engine failure. Andre Cantin was at the controls and describes what happened: “We were flying VFR at 4,500 feet when we felt a loss of power. We immediately decided to re-route to Vichy-Charmeil but the trouble persisted and the aircraft was losing altitude rapidly. We saw that we would not reach the aerodrome and decided to make a landing in open country. On the horizon we spotted a field which seemed long and clear. We extended the wheels on the amphibious floats and the flaps. On approach, we realised we were coming down on bumpy ground, with many holes and obstacles. Just before touchdown we felt our first shock as the right float struck a hillock. We came down harshly fifty metres further on. The initial impact had caused hydraulic fluid to leak and this caught fire, burning all around the aircraft. We immediately evacuated the aircraft but soon it caught fire and was burnt completely in flames and thick smoke”. A sad end indeed to such a fascinating project.